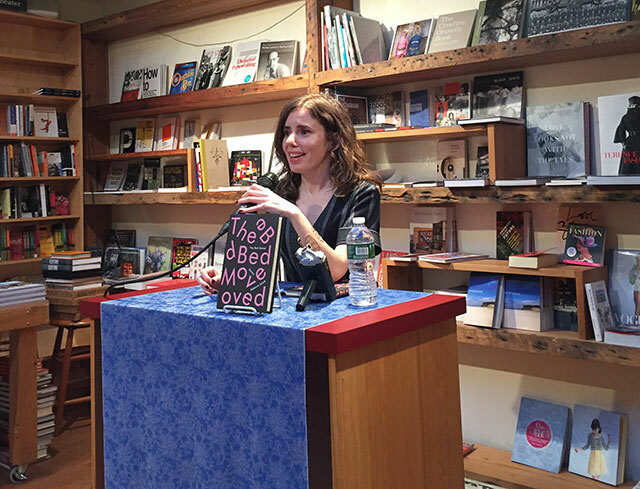 Rebecca Schiff celebrated the launch of her debut collection of stories, The Bed Moved, last week at BookCourt in Brooklyn. The collection has won the adoration of the New York Times, with the paper stating that the collection has a “Nabokovian boldness and crispness of phrase.” Schiff read from a story from the collection before answering audience questions and signing copies. The collection took her six years to write and publish. When Schiff started writing the stories, she was intending to write a collection. She was simply writing stories. As she kept writing though, she began to think about putting them together as a collection. Eventually the stories coalesced into a book. The inspiration for the stories are varied, she explains, and sometimes the inspiration never comes. “Sometimes I find it right away, sometimes I have to write into,” Schiff said, implying that some stories naturally evolved only after she begins the writing process. She read from a first person narrative about a young woman dating a pot grower and attending a clothing optional resort with him. The story is funny, and as Schiff reads, she delivers with impeccable comic timing. The audience laughs loudly as she read. “We’re all going to be dating weed dealers when it’s legal,” she quips after reading the story. In another story, a young woman charts the success and failures of her parents’ attempts to reroute traffic on their suburban street. The collection is filled with these unlikely narrators often in mundane situations turned eccentric by Schiff’s narrative voice. She is writing about ordinary people, but spinning them into eccentrics who can entertain. Schiff also says that she has never written anything longer than a short story, but she does hope to eventually.